Can I Compost Leaflets and junk mail? | Can I Compost This? Can I Compost Leaflets and junk mail? While nearly all paper will quickly decompose with a little moisture, it’s usually better to recycle leaflets & junk mail through your paper recycling bin rather than put them in the compost. In order to be eye-catching, these days leaflets are often heavily printed with bright colours on glossy paper. Plastic coatings or synthetic addictive are often added to the paper to achieve that shinyness and those, alongside the inks, can introduce unwanted chemicals into your lovely compost heap. 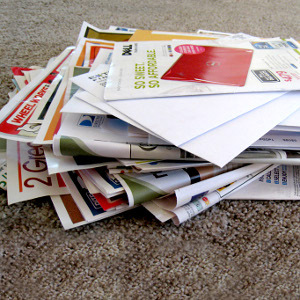 Envelopes containing, or included in, the junk mail also usually used synthetic-based glues. Basic leaflets, lightly printed on normal office paper or even better newsprint, cause less of an issue for a compost heap but it’s still better to recycle them: it’s better for them to stay in the loop for as long as possible. Don’t forget, in the UK, you can reduce the amount of (addressed) junk mail you receive through your letter box by signing up to the Mail Preference Service.